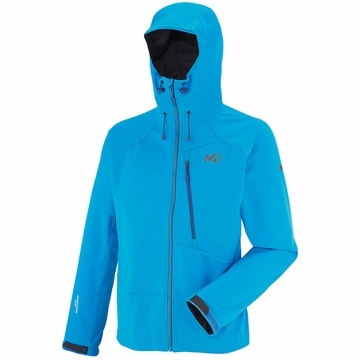 "Specifically and ergonomically designed with a soft and windproof fabric, this hooded protective jacket is built for the high mountain and high altitude addicts. The secret? A knit-sandwiched GORE® WINDSTOPPER® 3L made for optimum comfort. This stretch fabric enhances freedom of movement provided by the alpine fit. The fabric used is highly breathable. On beautiful, cold days, you will appreciate the subtle warmth of the knit and the possibility to carry away heat using the underarm vents. Quick adjustments allow to tightly fit the jacket's hem and collar. Rated as a LOW IMPACT™ product, it is built with sustainability in mind.